Of course, it would happen. The day after the Star Tribune published my list of the 10 best concerts of 2010, I saw another outstanding one that should have been on the list. Ronnie Spector’s Best Christmas Ever show Sunday at the Dakota was the best performance by a 1960s vocal act I’ve seen in recent memory. Great spirit, great songs, great musicianship. Making her first Twin Cities appearance since 1977, Spector, 67, seemed as ageless as her songs seemed timeless. She still has big hair and a tiny body, but, most importantly, she still sings with the sweetness and innocence of a teenage girl. Oh, sure the Ronettes (her trio) were known as bad girls because of their heavy mascara, short skirts and big hair. But their songs were about young love and she sang them with infectious enthusiasm Sunday to the delight of the crowd. And she seemed genuinely thrilled by the boisterous reaction. The Rock and Roll Hall of Famer may not hit all her high notes, but she can still belt with that unmistakably ebullient, nasally voice with the Spanish Harlem accent. (When she talked, she sounded like Rosie Perez’s older sister. ) She had two female backup singers (including Jenny Muldaur, daughter of Maria Muldaur) providing Ronettes-like harmonies on those whoa-oh-oh’s (and when one of the male keyboardist joined in, there was almost a Beach Boys vibe to the backup vocals). The key to Spector’s sound, though, was drummer Liberty DeVitto, best known for his many years with Billy Joel. He had the booming sound to drive the songs as well as the percussive filigree (sleigh bells, etc.) to provide the perfect Phil Spector Wall of Sound touches. Of course, the attitude adds to her persona, but Sunday’s 90-minute performance was really about the songs, the spirit and the season. A portion of the set list was devoted to Christmas tunes, including the three classics the Ronettes recorded for 1963’s “A Christmas Gift to You from Phil Spector” – “Frosty the Snowman,” “Sleigh Ride” and “I Saw Mommy Kissing Santa Claus” (an encore, performed in a red Santa’s helper’s suit, trimmed with white feathers). Spector offered three numbers from her brand new holiday EP, most notably the title track, “Best Christmas Ever,” which sounded as good as any Phil Spector classic. Among her nearly two-dozen selections, Spector did several Ronettes numbers, including the strutting “(The Best Part of) Breakin’ Up,” the dreamy “Walkin’ in the Rain,” the goosebump-inducing “Be My Baby” and ‘I Can Hear Music,” the Beach Boys hit that she totally owned (and recorded first). She covered an Amy Winehouse girl-group tribute and did a few pieces from her own more recent solo recordings, including Joey Ramone’s “She Talks to Rainbows” and Johnny Thunders’ “You Can’t Put Your Arms Around a Memory,” a superb slow-burn song destined to become a country hit someday. To the disappointment of many in the packed Dakota, Spector did not perform “Say Goodbye to Hollywood,” which Billy Joel wrote about her and both of them recorded it. (It would have been special to hear it with DeVitto on drums.) Instead, we got John Lennon’s “Happy Christmas (War Is Over),” which was a little pitchy, and lots of holiday fare. 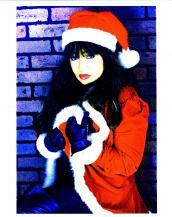 This may not have been the best Christmas show ever, but it was the best Ronnie Spector show ever in the Twin Cities. Spector performs again at 7 p.m. Monday at the Dakota.